As you may know there are many codes which can be entered in the home-screen of your Nokia S60 device, e.g. to see what firmware your device has. Because there are so many of those, and not everyone does even know of them, we decided to write this guide for you. Some of the following codes can reset your phone or change settings, so please make sure to know what you’re doing with entering a code – there’s a description below every code, read it first! Besides the following codes we also give standard knowledge like how to open the Task-manager or switch the profile in an instance. *#06# displays the IMEI – the serial number – of your phone. On the box of your device there should be the same number on the little sticker on one side of the box. *#0000# displays the firmware and its date. Additionally there is the type (e.g. RM-159) and the name of your phone. This menu also gives you, if you own a N96, 5800, N85 and some other devices, the chance to update your firmware over the air. *#92702689# (*#war_anty) displays the “warranty-menu” of your phone. Actually, in S60 it shows the time you spent on calls already. 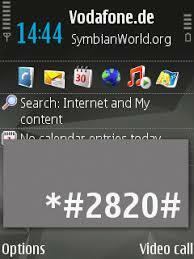 *#2820# (*#bta_#) displays the bluetooth-address of your device. Every device has another bluetooth-address (works just if it has Bluetooth!). *#62209526# (*#mac_wlan#) displays the MAC-address of your phone (works just if it has Wireless Lan!). 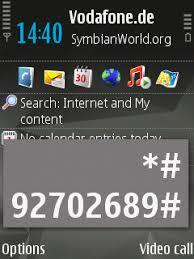 By pressing 0 (zero) for three seconds on the home-screen you easily can open the web browser. 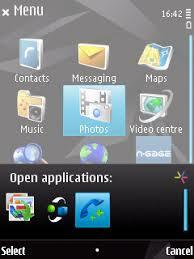 By pressing the Menu/Home key for three seconds you open the task manager, which shows all opened applications. 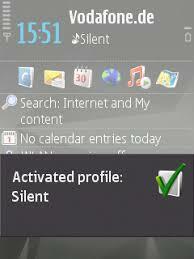 Holding # for three seconds on the home screen you change the active profile to silent or back. In the File manager, Photos application or Gallery you can sent your files really easily by pressing the green-answer key. Once you done that a lists pops up and you can decide whether you want to sent the file via e-mail, Bluetooth, upload it to a service or sent it as a message . NOTE: The following codes can RESET your phone to the factory settings, all data on it will be deleted! *#7780# (*#rst_#) does a soft-reset to your phone. *#7370# (*#res_#) does a hard-reset to your phone. Actually it could be, that we forgot a code or you now one that we don’t have here. If so, please leave a comment. dear my nokia 5530 volume keys not working, now my call sound is too low, how to increase my phone volume..
please help me ..my nokia s60 i cant space when i write a message..where should i press to space?